It was rough sledding on the second night in San Francisco for "X Factor"
, as Thursday's audition show opened with a string of duds that proved looks matter, but they don't win competitions. Also, a pattern is already emerging over the two-night debut: producers are keying in on manipulative, entitled bad girls who talk smack and then get delicious comeuppance when their vocals go all wobbly and they are shown the door. Mixed in with the parade of wackos, stalkers and goofballs were a couple gems, though, along with the clear emergence of new judge Demi Lovatoas the heart and (crush-prone) soul of the new season. Swag on infinity: If confidence were cash, Johnny Maxwell, 16, would be a rich man. The supremely poised teen came out and performed a rap/sung original song about brushing off haters called "All These People" that had L.A. Reid shouting along by the end. The vocals? Eh, they were like B-minus Bieber mixed with passable rhyming. Try to tell that to the girls, though. Simon Cowell praised his ambition and the "steel" in his eyes. Mean girls and possible security threats: Coming on like the lost, even more annoying Kardashian sister, Florida's Lexa Berman, 22, (barely) dressed for the club instead of the stage and sprayed her confidence all over the room. But she kind of forgot to work on, you know, the vocal part. The horrified look on Britney Spears' face when superfan (okay potential restraining order candidate) Patrick Ford, 20, came out with flowers and sang, nay, desecrated her song "Circus," was, well, priceless. It wasn't great and for a minute it felt like someone was gonna have to call security ... or a sniper, when you refused to leave the stage and just dead-eye stared at her for wayyyy too long. Divas come in all sizes: Tech support guy Jason Brock, 34, was also super-confident and had his big Cher-style Las Vegas show already plotted out in his head, which seemed like a sure sign that he was going to tank, hard. But, man did he bring the glitter bomb divatude to Billy Joel's "New York State of Mind." You could tell when Reid shut his eyes and gave a standing O. "You love music and it shows, I loved the audition," an initially skeptical Cowell said afterward. 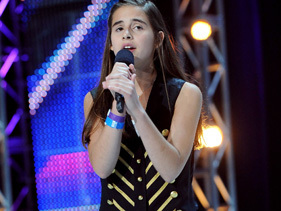 The judges were also shocked at how good 13-year-old Carly Rose Sonenclar was, especially since they tried to warn her about how hard Nina Simone's "Feeling Good" is to sing. And then she slayed it with a measured poise and confidence well beyond her years. "A star is born," Reid proclaimed. Britney says: It's already clear we're going to get two things from Spears: a series of GIF-worthy funny faces and succinct, sharp declarations. Some of her top Thursday quips included calling Maxwell: "adorably cute." Berman: "It was one tone the entire time you were singing and it was really boring." Brock: "he's amazing ... I thought that was magnificento." On Sonenclair: "Wow, Ms. Thang, you are a little diva!" Demi diary: She told Berman straight up that she wasn't likeable. We also learned on night two that while Lovato can be wowed by cute boys, and loves her some six pack abs, she's not afraid to break it to hotties that they can't sing. Some exceptions: "You sparkle and you ooze of joy," she told Brock. "I want to buy your music right now," she admitted to Sonenclar, praising her preternatural confidence.